Make sure your taking the best vitamin K supplement and it's right for you! Can you trust your vitamin K supplement? 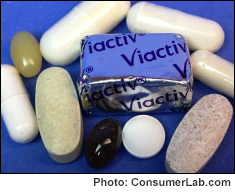 ConsumerLab.com tests revealed some popular vitamin K supplements contained less vitamin K or another key ingredient, than claimed. One of these was also found to be contaminated with lead. Another product failed to disintegrate in the allotted time. Fortunately, our tests also found several high quality products which can provide a significant dose of vitamin K for less than one cent per day. Among products which were Approved, ConsumerLab.com selected several Top Picks for providing the best quality and value. In addition to its critical role in blood clotting, vitamin K may increase bone mineral density and reduce the risk of hip fracture when consumed with adequate intake of calcium and vitamin D. For this reason, vitamin K supplements have been clinically studied for aspects of bone health, as well as for other applications, such as cardiovascular health. Results of these studies, however, have been mixed. You must be a member to get the full test results and quality ratings for twelve supplements with vitamin K -- eight selected for testing by ConsumerLab.com and four others that passed the same tests through CL's voluntary, Quality Certification Program.